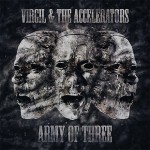 Share the post "Album review: VIRGIL & THE ACCELERATORS – Army of Three"
Having made a big impression with their rock-blues debut album ‘The Radium’ and having consolidated their standing as one of the most exciting young bands on the circuit with ‘Live at Marshall’, ‘Army of Three’ finds VATA taking the next step forward towards arena rock. Last year, Virgil snaffled the coveted ‘Best Guitarist 2013’ category at the Euro Blues Awards and ‘Army of Three’ finds the power trio pushing their blues-rock hybrid into full rock mode. They’ve hooked up with hard rock producer Chris Tsangarides who transforms Virgil’s burning licks, Gabe’s explosive drumming and the trio’s collective energy into an enveloping wall of sound. ‘Army of Three’ has the swagger of fellow touring band Tracer, though Virgil’s incendiary soloing is closer to Philip Sayce’s unfettered bluster. They’ve also managed to retain an organic jam feel that sometimes bubbles up before the hooks. Aside from a big sound, the production places the dynamic emphasis on a succession of drop-downs, pregnant pauses and focuses on additional exclamatory chants and hypnotic ‘oohs’ to sucker us into the hooks. This is especially so on ‘Blow To The Head’, which is of full crunching chords, a chant style hook and an avalanche of searing guitar over some extravagant cymbal splashes. Longer term fans might be surprised at the rock direction of the album, but need look no further than the coruscating wah-wah solo that snakes its way though the opening ‘Take Me Higher’ as confirmation of the new found melodic hard rock direction. The powerhouse single ‘All Night Long’ features high octane shredding, killer riffs and cymbal grabs to hit the spot. Gabe’s powerhouse drumming and Virgil’s fiery riffs head for the stars, as bassist Jack Alexander Timmis somehow manages to hold it all together. ‘Love Aggression’ offers a change of pace with a close to mic confessional from Virgil on a passive /aggressive relationship song. It’s got a very catchy groove full of space, effective whispered vocals and a magnificent solo that shows just what he is capable of. In contrast ‘Give It Up’ opens with a galloping drum roll and is a primal thrash full of buzz guitar before an unexpected blues harp wail and a very obvious repeated hook. The band has to work hard to transform the double tracked vocals and dirgy stomp of ‘It Burns’ into something worthy of its uplifting hook and big toned solo, while Virgil’s muscular solo also rescues the rather pedestrian ‘Stand Up’ before an unexpected break- down. ‘Anymore’ is an 80’s style big hair rock ballad with Lizzy style harmony guitars that sounds like link-piece to the more substantial quasi southern rock anthem ‘Free’. The tale of an unrequited love is home to a big chorus and a melodic guitar sweep that takes the song to another level, one which Virgil’s vocal sometimes struggles to reach. However, as with the album as a whole his imperious guitar line carries the song home. This entry was posted in ALBUM REVIEWS, ALBUM REVIEWS (Mobile), All Posts and tagged album, Army of Three, Chris Tsangarides, Gabe McMahon, guitar, Jack Alexander Timmis, Philip Sayce, review, rock, Tracer, Virgil & The Accelerators, Virgil McMahon. Bookmark the permalink.